Electronicintifada.net is one of the main BDS-promoting portals in the Western world, which also serves as a communications platform for pro-BDS activists and the promotion of its ideology. It was founded in 2001 and operates out of Chicago. The portal is mostly affiliated with its co-founder Ali Abunimah, a Palestinian-American journalist and son of the veteran Jordanian-Palestinian diplomat Hasan Abunimah. Ali Abunimah is an advocate of the “one-state solution,” as reflected in a 2007 book he wrote, One Country and a 2009 article “Jews, Israelis, and the One Country Solution.” According to Israeli sources, Ali Abunimah supports the establishment of one democratic Palestinian state on the ruins of Israel, which “will take into consideration the affairs of the Jewish population of Israel.” He refers to Zionism as a “dying project.”405 In 2015, Abunimah wrote the foreword to a book of essays called Against Apartheid: The Case for Boycotting Israeli Universities,”406 which focuses “on the complicity of Israeli universities in maintaining the occupation of Palestine, and on the repression of academic and political freedom for Palestinians” to explain “why scholars and students throughout the world should refuse to do business with Israeli institutions.”407 Abunimah is very active in conferences, especially at universities, and on YouTube. The ADL notes that academic departments have sponsored or co-sponsored anti-Israel events in which USACBI took part. For example, Remi Kanazi, an organizing committee member of USACBI, spoke in September 2015 at John Jay College at an event co-sponsored by the Department of Gender Studies.409 Kanazi is a Palestinian-American poet who in his writings presents Israel as a racist Apartheid state that has robbed the rights of the country’s original inhabitants who are seeking “justice.” Kanzai has a personal website.410 He promotes BDS over YouTube as well and sometimes writes for electronicintifada.net. Adalah-NY activists demonstrating in front of Lev Leviev’s diamond store in January 2016, as part of a campaign dedicated to boycott the latter’s Diamond Empire. CPAO is a coalition of Palestinian-American organizations that seems to mainly comprise of secular, nationalist components. On its website, it links to online streaming of the TV broadcast of the Palestinian Broadcasting Corporation (PBC), which acts within the jurisdiction of the Palestinian Authority. According to Maher Massis, one of its leaders, CPAO was formed within the framework of Arab and Muslim U.S. organizations in order to focus specifically on Palestinian issues.423 According to its website, CPAO aims at addressing issues that concern the Palestinian-American community. It facilitates presentations, lectures, and op-eds supporting the rights of the Palestine people, including lectures by prominent personalities at American institutions, universities, and houses of worship, as well as on television, radio, and the Internet. In August 2014, it was reported that Rahif Lafi Awadallah, a member of the “BDS committees” and CPAO, met in Ramallah with the aforementioned Taysir Khaled at the PLO’s Expatriate Affairs Department.425 A video of a speech by Awadallah is available on the Facebook page of Fatah supporters in Chicago.426 The meeting reportedly discussed the role of the Palestinian community in the United States in pro-Palestinian advocacy, as well as on the necessity to widen the BDS campaign in various fields. This meeting was part of a greater outreach effort by Khaled’s Expatriate Affairs Department at the PLO. Later that month, another meeting with U.S.-based activists (see below) was also reported. An edited video of the CPAO’s 2015 Banquet Gala is available, featuring several leading Coalition figures and guest speakers. Maen Areikat, the ambassador and PLO’s chief of mission to the United States, spoke about the importance of raising awareness of Palestinian causes in the United States specifically, and the necessity to utilize the almost half a million Palestinians in the country. Chris Henzel, Director of Israel and Palestinian Affairs at the State Department, surveyed the situation of reconstruction efforts in Gaza, The keynote speaker at the Gala was Laila Ghannam, governor of Ramallah and Al-Bireh,427 a senior Fatah figure and the first Palestinian woman to have been elected to the position of governor (in 2010). 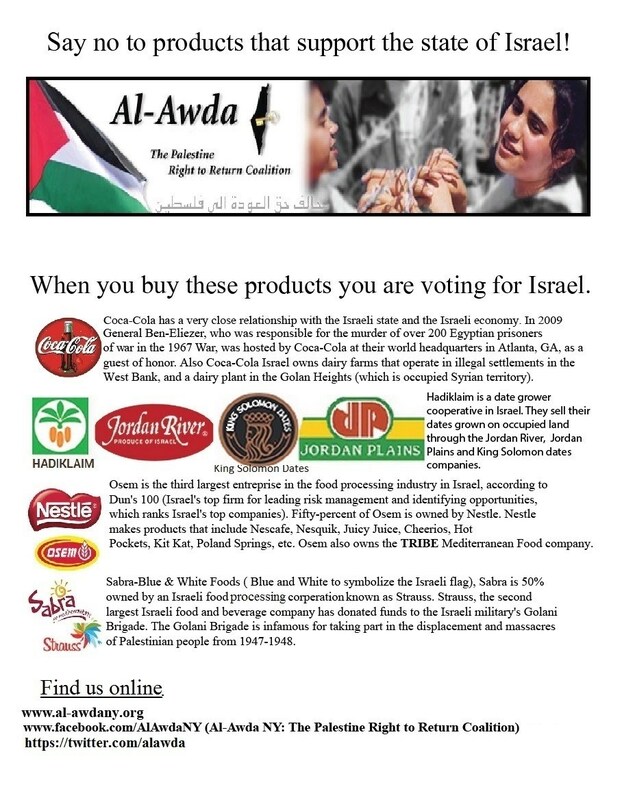 Al-Awda has been active in anti-Israel and “anti-Colonialist” demonstrations, conferences, and conventions, and has been promoting BDS on international companies having ties with Israel. This apparently non-formal coalition is apparently based in Chicago. Its coordinator is Senan Shaqdeh, who, according to the Foundation for Defense of Democracy, has been described on a PLO website as a former PFLP “mountain fighter” in Lebanon.436 Shaqdeh had been quoted in Arabic reports in the context of student bodies’ endorsement of BDS437 and on his Facebook page (currently unavailable) promoted various BDS-related events.438 In early September 2014, Shaqdeh was interviewed following a trip to Ramallah, during which he held meetings with members of the PLO’s Executive Committee, with the PLO’s Expatriate Affairs Department, with which, he added, they coordinate their activities, and with President Mahmoud Abbas and Prime Minister Rami Hamdallah. According to Shaqdeh, the meetings were aimed to move forward and become pro-active and start initiating various actions rather than being reactive as was the situation until then, and form a joint framework for cooperation with American Left-wing and student bodies. He also spoke about the plans to form a new U.S. body called Americans for Justice in Palestine, aimed to bring together Palestinian businessmen, academics, and social and political activists. This body was to include three branches – one for liaising with the American administration and lawmakers, another for uniting and mobilizing the Palestinian community abroad around issues like the foundation of a Palestinian state, the right of return, and bringing down the separation wall, and a third for promoting BDS.439 It is unclear whether this body was eventually formed, and Shaqdeh himself appears to be less active lately. In any case, Shaqdeh referred to developing cooperation with the Palestinian authorities.